Do no touch moth or caterpillars! The adult moth has a wingspan to 5.5 cm and a woolly appearance, wings are brown, hindwing paler, abdomen is banded, yellow, and dark tan with a tuft of white hairs at the end. 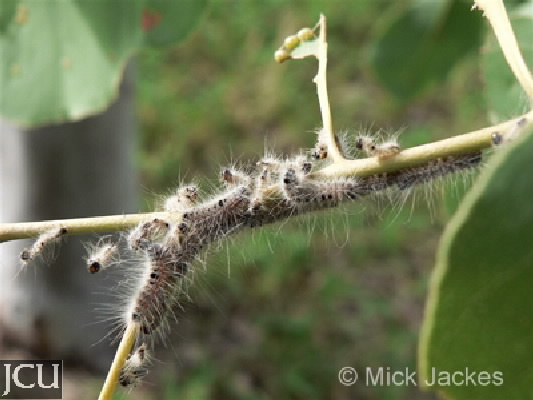 The larvae have a brown head, the body is grey with dark bands and numerous long, white irritant hairs. They live inside a brown silken bag and come out at night to feed on host plants chiefly wattles and Grevillea striata (Beefwood). When traveling from tree to tree they form a procession.